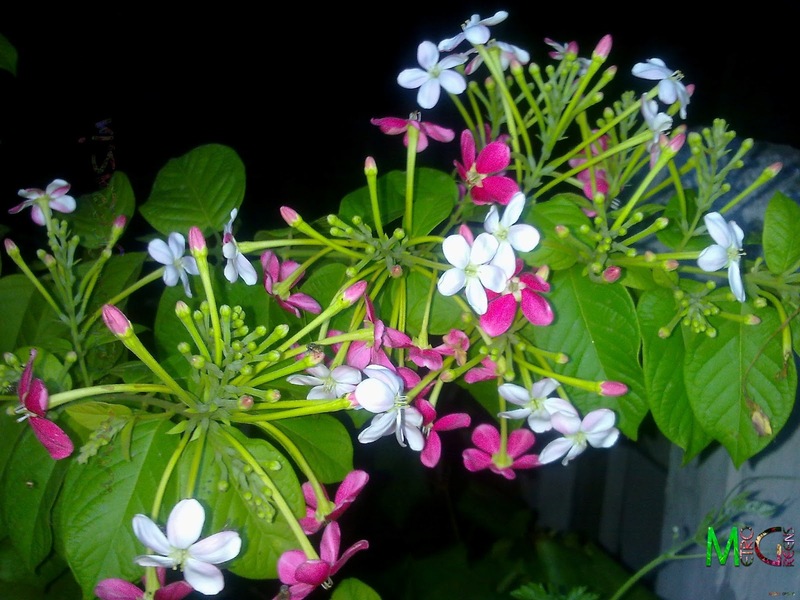 Today I'm going to take you through some pretty blooms of the Rangoon Creeper that is blooming in my garden. Well, it did bloom a for a short duration during spring, but, the blooms in monsoons is a totally different league. The plant has got a new life after scorching summer heat in the hot months of April, May and June, and just during the onset of the monsoon season, new twigs and buds started appearing, promising me a more appealing visual treat. And now it's in blooms. I've captured a few shots (night time ones) which, I find worth posting here. The Rangoon creeper is a fast growing and hardy creeper that is visually attractive owing to its foliage and its blooms. This is a perennial plant that blooms almost throughout the year. 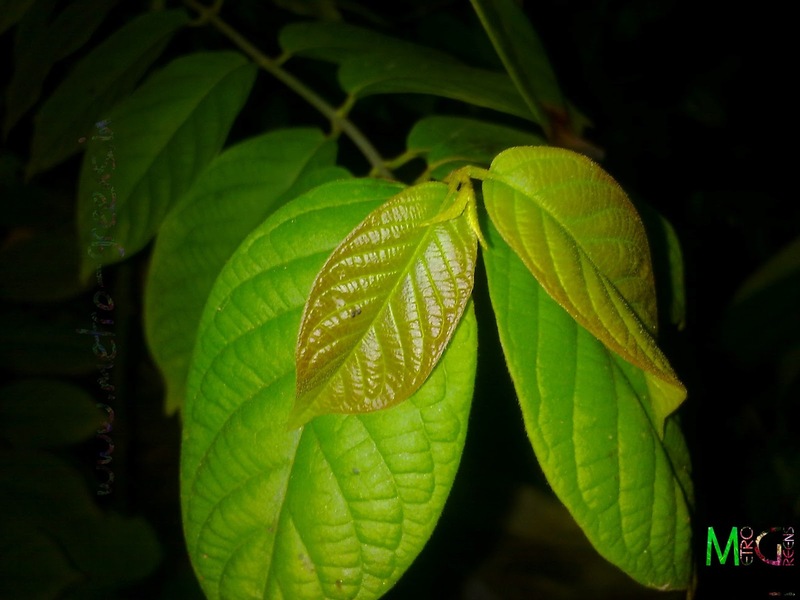 It is a tropical vine that grows well in the tropical regions. The blooms have a distinctive feature as its flower show a variety of colours starting from white when freshly bloomed, as the time passes the colour changes to darker shades of pink, and finally ending into an attractive cherry red colour that looks strikingly attractive. The flowers bloom in clusters or bunches of flowers that last around 2-3 days. The flowers have mesmerizing fragrance that is exotic and the fragrance is highest during night, as it is this time when new flowers bloom. In some pictures below, you can see some of these new white blooms. The flowers, in bunches usually turn towards the ground, may be due to weight of so many flowers blooming in a relatively thin stem. The plant doesn't have any seeds and the only method of their propagation is with the help of stem cuttings. Rangoon creepers are very easy to grow and maintain. It's main requirements include regular watering so that it doesn't fall scarce of water and some fertilizers (organic or inorganic), once in a while, if planted in pots. I hope I needn't mention that like all other plants of my rooftop garden, this one's also planted in a pot. Uses: Ornamental uses, can be easily trained to climb on boundary walls, trellises, and even on building walls (with some external support to climb up). Flower Colour: White-Pink-Cherry Red. 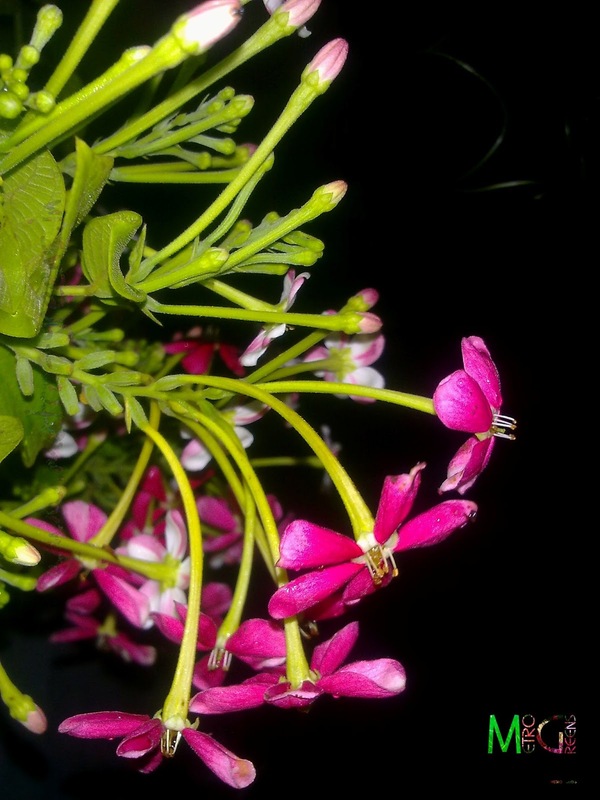 The flower changes colour as it ages from white, initially, to light pink, increasing in saturation of colour and ultimately very dark cherry red. Buds with exposed petal part usually are light pink as the flower blooms. Leaf Type: Oblong, elliptic green leaves arranged on stems in an opposite arrangement. Fragrance: Sweet smelling, highly fragrant flowers. Fragrance is typically highest during night, and early morning, which fades as the day progresses. Plant Type: Climber, Vine, Creeper. Reproduction: Vegetative propagation, Stem cuttings. No seeds (Atleast I can't see any). Suitable Climatic and Soil Conditions: Mainly tropical climatic conditions with full or partly shady conditions. Well drained soils are well suited. Must be provided with some external support if placed somewhere, where the plant is susceptible to strong gusts of wind. Leaves of the Rangoon Creeper. 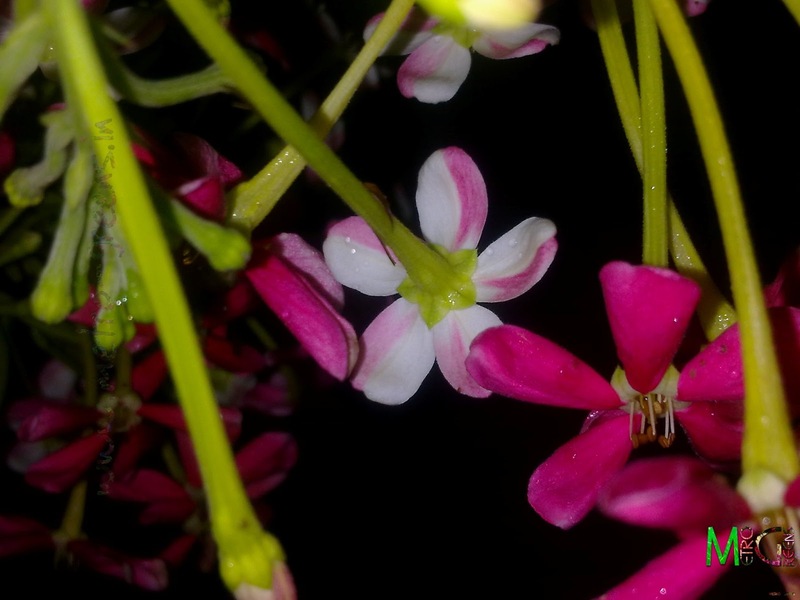 Some blooms of the Rangoon Creeper. Newly bloomed flowers are white in colour. Ones with pink and darker pink shade of colour are a day or two old. 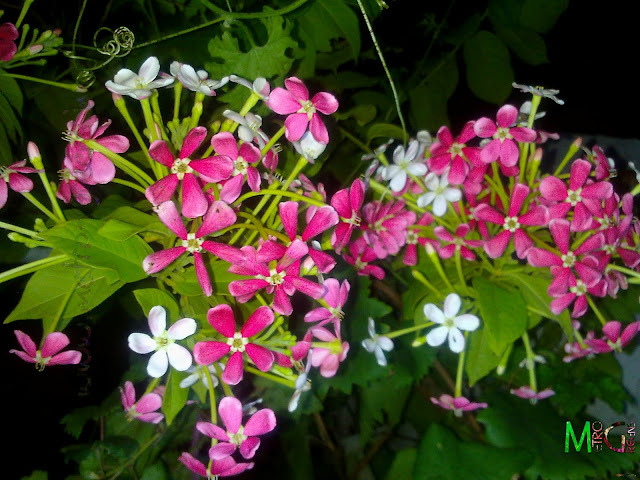 Some blooms of the Rangoon Creeper. Newly bloomed flowers are white in colour. Ones with pink and darker pink shade of colour are a day or two old. Look at the pink coloured patch at the back of white bloom. 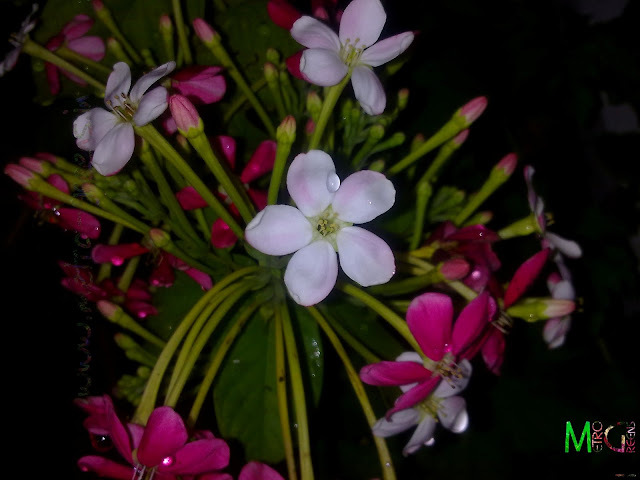 Some blooms of the Rangoon Creeper. You can very sell see the buds as well. An isolated green coloured thread like thing is a tendril of my bitter gourd, aka bitter melon vine. Some blooms of the Rangoon Creeper. Newly bloomed flowers are white in colour. Ones with pink and darker pink shade of colour are a day or two old. The plant can be seen in all its glory in this photo. I thought it would be nice if I could add some information about the plant I'm covering in a post. I'll try including such information in my forthcoming posts. However, please note that I have used Internet and good ol' search engines to gather information about the plant(s) I have covered in this post. Kindly bear with me if you find some information incorrect and misleading in any manner. I would be highly obliged if you could point me out in case you find some incorrect information. I'll be back with some more information in upcoming days. till then, stay tuned, keep visiting and HAPPY GARDENING. Thanks for stopping by and commenting. I hope that my blog may help you out with more such info. Hi MG! Love the name of your blog. I see you have been active while i've been dormant... lol. No wonder I didnt come across your blog on my numerous jaunts around the gardening blogosphere. Just dropped by to say hello. Will be back to stroll through your garden at my leisure. Your photographs are beautiful! It is always a pleasure to come across an Indian gardening blogger! Hello Sujata, You're always welcome to stroll through my gardening space the way you please. It's a pleasure for me too to meet someone with same interests as mine. many thanks for the very informative blog. Thanks for encouraging me to take take interest in growing this beautiful vine.